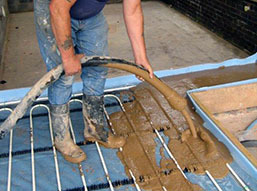 An underfloor heating system is available for both new builds and listed buildings. This type of heating system is ideal for new build homes where insulation and air-tightness have strict guidelines. If you have an older home, underfloor heating can be the perfect solution alongside an increase is insulation can greatly benefit the efficiency of your home. We can increase the flow temperature and space the tubing closer together, and with floor construction designs that are design to specifically give a higher output of temperature we can install the perfect system for your home. Our expert installers will be able to give you any advice you require and inform you of any areas that could experience a slightly lower level of efficiency on cold winter days. We would also tell you in we believe that your home is unsuitable for under floor heating.